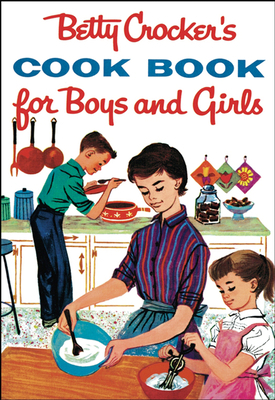 A whole generation of Baby Boomers grew up with Betty Crocker's Cookbook for Boys and Girls, and they have helped to make it the one of the most requested titles in the Betty Crocker archives. Now back by popular demand, this timeless favorite stands ready to capture the hearts of a new generation of budding cooks. Packed with recipes that are just as popular with kids today as they were 45 years ago, it shows how to make everything from Ice Cream Cone Cakes and Pigs in Blankets to Cheese Dreams and Sloppy Joes. The small format, easy recipes, charming color illustrations and photographs, and even the cover, are all the same as they were in the 1957 edition-and just as delightful as ever. The only innovation is the concealed wire binding that lies flat for easy cooking while being sturdy enough to withstand energetic handling by kids in the kitchen. It's the ideal book to give or to keep, for retro appeal, and for getting today's kids started in the kitchen.